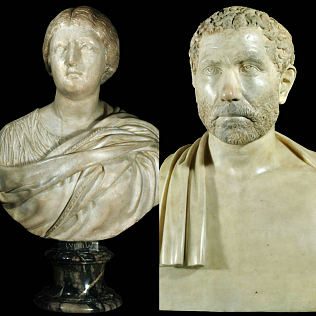 Two busts - part of the Roman art collection of the Gallery - have been restored, thanks to the funding from the Guides of Florence. The ancient statues of the Uffizi, in recent times, are involved in a process of recovery and revaluation. This restoration is the result of this interest. What works have been restored? They are part of the oldest core of the Uffizi collection and they date from the second century A.D. The first is a female portrait. In the past it had been identified with Lucilla, wife of Lucius Verus. The second is a male, an unknown man, from the end of the second century A.D., who was identified with Geta. The intervention has cleaned the opaque layer of deposits, and allowed to notice some interventions that the artworks underwent in late antiquity (for example on the hair of the female portrait). The Association Guides of Florence financed the restoration in memory of Ugo Primadei, president from 2003 to 2010 and a passionate researcher, who died suddenly in 2015.